MAZARS GRANGE skipper Andrew Brock admits his players are still hurting from last week’s defeat to Carlton – but they are focused on tomorrow’s home match with Aberdeenshire in the CSL Eastern Premiership. The defeat six days ago to their Capital rivals saw Arbroath leapfrog the Stockbridge men at the top of the table with just two league matches remaining. If Arbroath win their games – against Autoecosse Forfarshire tomorrow and then at Watsonians next week – they will lift the trophy, but Grange are keen to keep the pressure on. Brock said: “It was really disappointing that we saved probably our worst performance off the summer for such an important game as last week’s – and against our local rivals too. “Carlton bowled well enough but, with the bat, none of us really applied ourselves properly and we have to hold our hands up for that. “We knew we would have to bowl very well to defend 140, but Carlton’s batsmen scored some quick early runs and that made it hard for us. The loss has really turned things around because Arbroath are now out ahead, but we had a good chat after the match last week and as a group we are determined to give the next two matches our all. Aberdeenshire travel to Edinburgh for the match sitting in fifth place in the table. They won the league last summer and, while they cannot win it again, they will still be keen to end 2015 on a high and put a further spanner in Grange’s title hopes. After last week’s polished showing, Carlton still have a slim chance themselves of winning the title. Tomorrow, they host Falkland at Grange Loan and will hope to have skipper Gordon Drummond back from injury. Watsonians are on a good run, having won four league matches on the spin, and they have a busy weekend. 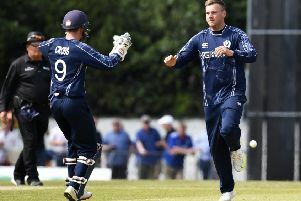 Tomorrow, they welcome Stoneywood-Dyce to Myreside and then on Sunday travel to the national Twenty20 finals day at Poloc where they will take on Forfarshire in the semi-finals. At East Barton Avenue, already-relegated RH Corstorphine take on Heriot’s with both sides probably looking forward to the end of frustrating respective seasons. In the Baillie Gifford ESCA Championship, Murrayfield DAFS go to Holy Cross knowing a win is vital in their bid to avoid relegation. In East One, Edinburgh Accies take on Watsonians II while on Sunday non-league Woodcutters will aim to win a trophy. They take on Hawick and Wilton in the Active Edinburgh President’s Plate final at Inch Park.